Live video is poised to explode on social platforms. Video will be the fastest growing content category on mobile, desktop and everywhere else through at least 2020.
https://www.tradebit.com predicts digital video ad spending will rise from to $28.08 billion in 2020. * Why is Facebook Live a big deal for marketers? * How to use Facebook Live? * How can brands grow with Facebook Live? 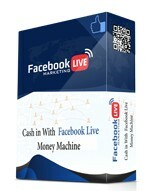 Also look for the video version, ‘Facebook Live Marketing Accelerator‘. This product was uploaded Mar. 2017 and has been checked for accuracy and scanned for viruses. Your satisfaction is guaranteed!